If you think your city has parking problems, wait till you visit Rome. 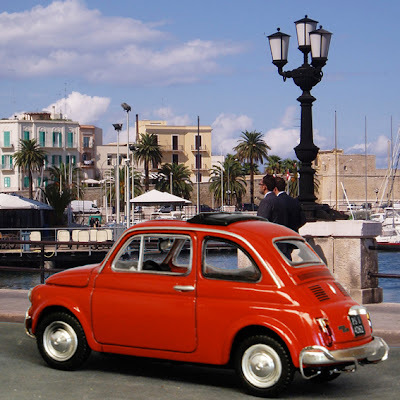 So it doesn't need a lot of imagination to answer the question: why do the Italians make great small cars? Because they have to, silly. And so today's posting is about a couple of small Italian cars sitting side-by-side in my diecast cabinet. Here they are down at the Gelato Bar. 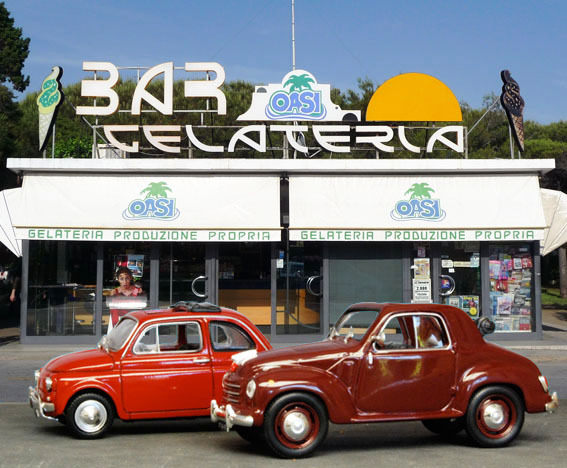 On the left, the Fiat 500L, and on the right, the Fiat Topolino. 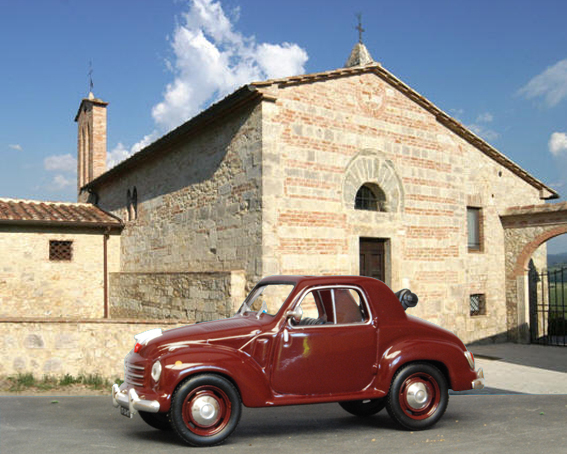 The Topolino, of course, is the much older vehicle, the predecessor of the more famous 500.
made. Though it was the predecessor of the Fiat 500, it was a completely different design. a lot of Topolinos on any Sunday, at church. we called these little cars Fiat Bambinos, and quite a few of them were sold here, too. However, instead of finishing off either on our knees in church praying or on our butts eating fish, I think it's perfectly appropriate to remember that lots of Fiat 500 drivers did what came naturally to most other car enthusiasts. They raced them. And in the case of the Fiat 500 a famous racing name is firmly attached to the Fiat 500, and that is the name Abarth. Carlo Abarth, the great race car builder and modifier, is associated with many brands in his illustrious career, but it would be fair to say he became very famous through his association with Fiat, and especially the 500s which he tweaked to an amazing extent. He modified everything, not just the engine. Suspension, steering, brakes, bodywork: even the badges were souped up. There's a great website from which I learned a lot about Abarth that I didn't previously know, and it's here. Carlo launched the Fiat 500 Abarth in 1958, and then proceeded to produce ever hotter, faster and more outrageous variants as each new generation of Fiat 500 came out. Go visit that website I linked to if you're interested. It's very well done. Now, I'll finish off this posting with a fab You Tube link to someone hooning in a cobblestone street in his Fiat 500 Abarth. What a sound, what a rude car, and some fancy yet potentially dodgy driving, too.